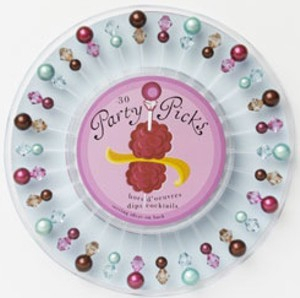 Dress up appetizers and drinks with these beautifully crafted raspberry picks. These picks are 3 long and made of plastic with beads at the top. The pack comes with 30 picks in a convenient pull-out-pick tray. Just place a bowl in the center of the tray and you've got a practical and beautiful display. These picks are also a sanitary solution to serving your guests.